In this second Harley collection, Harley gets fed up with crime and decides to switch sides-much to the chagrin of Batman. Then, Harley must whip her gang into shape while battling Killer Croc. 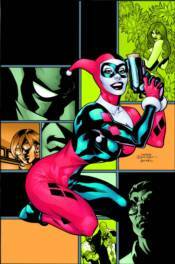 Collects HARLEY QUINN #8-13 and HARLEY QUINN: OUR WORLDS AT WAR #1.